How many times has a hotel salesperson asked you, “When will you make your decision?” Do you know what they’re really asking? Read on to find out. News flash: Hotel salespeople love to compete. I know – it’s kind of obvious. But most meeting planners forget about this very important fact when sourcing their meetings. You have the power to get their competitive juices flowing, leading to better deals and faster responses. Here’s a secret about salespeople: They don’t really care about the decision date. Heck, in my time as a salesperson, I knew that the chance of getting a decision on the actual decision date were slim to none. WHEN they’ll find out if they have a shot at your meeting. So try introducing a new date into the mix: Your Short List date. Adding the step of Short-Listing your hotel choices means tapping into a hotel sales person’s inner competition and will result in faster and more accurate hotel proposals … and some very good deals. The reason for this has to do with the study of another group of highly-competitive people: Athletes. To understand the effects a Short List date has on the competitive environment of the hotels bidding on your meeting, look no further than this past summer’s Olympic Games. If you recall, each race consisted of two separate competitions: the Prelims and – if you were good enough – the Finals. What’s so compelling about this format is that the Prelims force everyone to race as fast as possible to make the finals. No lollygagging or holding anything back. The Short List date does exactly the same thing, with the initial bids acting as your Prelims. If their proposals are good enough, the hotels can make it to the Short List and compete in the Finals. 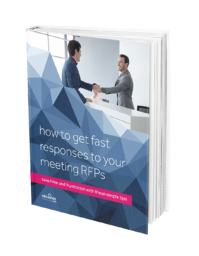 Make your Short List date as close as possible to the date you sent the RFP. You should need no more than a week to review all of the proposals and pick the ones that jump out at you. Why does this work? It keeps the sales manager engaged and eager to bid aggressively in order to make the Short List. You also eliminate extra work for yourself by gently dismissing those hotels that didn't make the finals, and only focusing on those that are right for you. I’d love to hear your experiences driving great meeting deals through the Short List – drop me a line at mike.mason@zentila.com or post your response below.